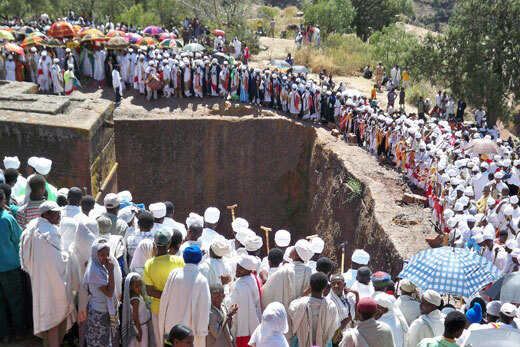 This package focuses on the annual celebration of Saint Mary at Axum fall on 30th of November, the festival that is attended by tens of thousands of people from all over Ethiopia, making it one of the most joyous annual pilgrimages in Axum, the “sacred city of the Ethiopians”. 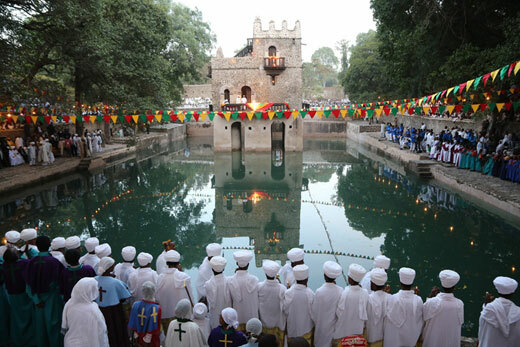 In addition to the celebration of Saint Mary, this cultural and historical adventure takes you through the rich historical, archaeological, religious and natural attractions of Ethiopia, which encompasses the historical towns of Bahir Dar, Gondar, Aksum, Mekelle, and Lalibela. A boat cruise over Lake Tana is arranged to visit old monasteries on the islands and with some distance drive from Bahir Dar, Blue Nile Falls will be visited. In Gondar which is known as the Camelot of Africa the royal enclosure will be visited. On the way to Axum the magnificent mountain scenery of the SimienMountains will be seen. After visiting the ancient city of Axum and its archaeological sites, you precede to Lalibela for the famous rock-hewn churches of Lalibela dated back to 12th and 13th century, often referred to as the “Eighth wonder of the World”. Day 18: December 10: Drive back to the capital for departure. Ethiopia developed a culture all of its own: its language, customs and arts are all distinctive. Surprisingly, not much has changed and the culture of the people is as it was long time ago. Ethiopia developed a culture all of its own: its language, customs and arts are all distinctive. Surprisingly, not much has changed and the culture of the people is as it was long time ago. Religion is a constant and central feature of Ethiopians society. 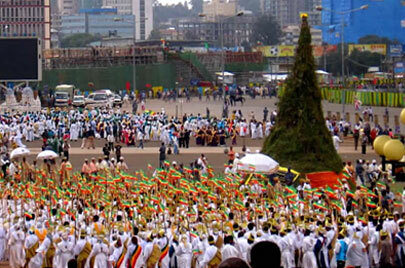 This package is designed to show you the colorful festival of Meskel, “The find of the True Cross”; in Addis Ababa celebrate to commemorate the discovery of the true cross upon, which Jesus was crucified, by the Empress Helena, the mother of Constantine the Great, which has been celebrated in the country for over 1,600 years.